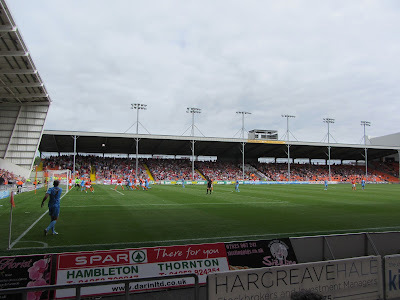 My eighteenth stadium of 2013 was on Saturday 10th August 2013 at Bloomfield Road in Blackpool, Lancashire. The match was Blackpool vs. Barnsley in the Football League Championship. Bloomfield Road is located in the west of the town, around 500 yards from the sea front. The closest railway station is Blackpool South which is 0.5 miles from the ground though the venue is also within walking distance of Blackpool North railway station and Blackpool Pleasure Beach railway station. Bloomfield Road has been home to Blackpool since 1901. 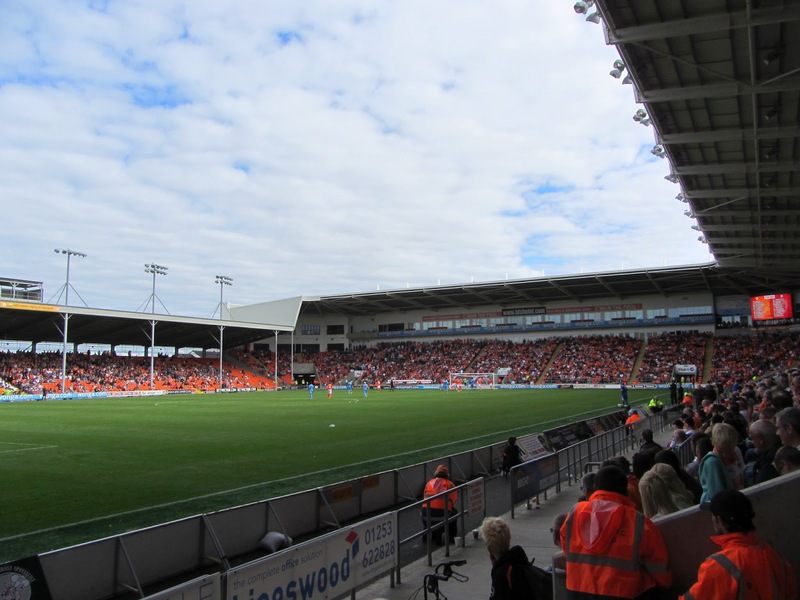 Bloomfield Road has been extensively renovated in recent years with the temporary East Stand the latest addition. This 5,120 seat stand was built in 2010 after promotion to the Premier League and is the only stand in the stadium to feature supporting pillars with a total of nine stanchions in place. 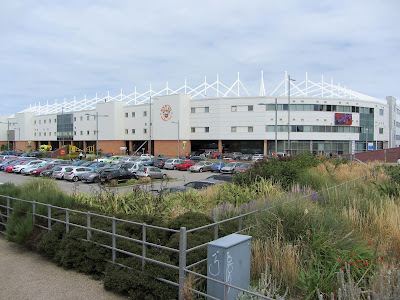 The East Stand is linked to the Jimmy Armfield Stand by a south-east quadrant which sits at the same height as the Jimmy Armfield Stand. This stand sits behind the goal at the southern end of the ground and holds around 3,500 fans as well as a top layer of executive boxes. The Sir Stanley Matthews Stand runs alongside the pitch on the west side of the venue and contains the club offices and reception as well as players dressing rooms. As with the Jimmy Armfield Stand it has a row of executive boxes behind the seating. A north-west quadrant joins this stand up with the Stan Mortensen Stand which sits behind the northern goal. This stand seemed quite vocal and it houses the designated family section. The game was a pretty poor advert for Championship football with neither side showing much quality. There were not many opportunities of note in the first period - Barnsley came closest when David Perkins fired just over the bar in the opening few minutes. Blackpool's best chance fell to Michael Chopra who dragged a shot wide after a good build-up move by the hosts. The second half began more promisingly and there was a good 10 minute spell of end-to-end football but sadly it didn't take long to revert back to being a long ball game with lots of wayward passing. Just when it looked like the game was going to end goalless a long Blackpool throw into the box caused problems in the Barnsley defence - Scott Wiseman attempted to clear the ball but it came off the underside of the crossbar and bounced over the line to give the home side the win.